Cold evening melting into misty night…scattered light of yellow lamp…..transistor playing a popular Bollywood number….rustle and crackle of peanuts being roasted in sand in a huge iron wok on smouldering logs….cloudy packets of peanut chikki and murmura ladduthela (cart)….a crowd around the thela to buy the goodies, some relishing goodies right there in the warmth of fire while others tucking into their pockets for their loved ones and disappearing in the darkness of approaching night. This was my town of the yesteryears. Today, it hard to find such sights and sound, the nostalgic aroma and the rustic goodies. 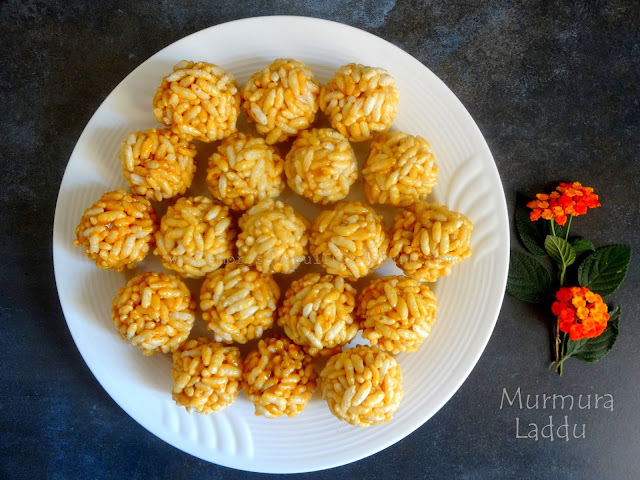 Yesterday, puffed rice laddu in a departmental store caught my attention. Perfectly made, neatly stacked and overly charged laddus did not have any charm as the ones that were sold in every nook and corner of the streets. I had to make my own batch. We love the crunch of the laddus and love the fact that they are low in calories. Jaggery makes them healthy. Roast puffed rice in a thick bottom steel wok for 3 to 4 minutes on low flame. Transfer roasted puffed rice to a plate. Put ghee in a thick bottom wok. Add crumbled jaggery. Stir and break lumps if any. Keep stirring till jaggery melts completely. 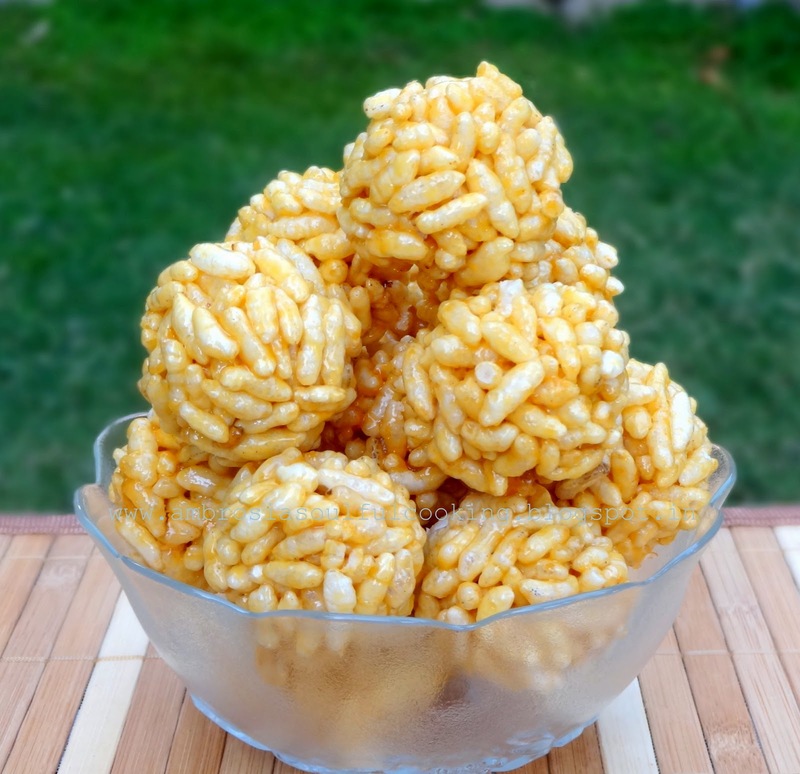 Add puffed rice and stir till it is evenly coated with melted jaggery. Turn off the heat. Take cold water in a bowl. Dip your hands in cold water. Take a handful of the mixture from the wok and make balls from the mixture. 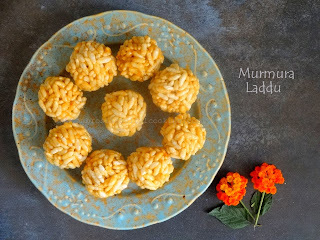 Press the mixture tightly to get walnut size laddus. (Apply water in your hands once and make 2 to 3 rounds of laddoos. Apply water again only when the mixture starts sticking to your hands. If in the end mixture becomes cold and hard, heat the wok on low flame, the mixture will become soft and easy to mould. Keep the laddus in the open for 1 hour.